The first stop on my Indonesian journey was Ubud (pronounced ‘Ou-boud’) in Bali. A complete wonderment of lush, tropical jungle set in high terrains is truly Mother Nature at its finest. I fell in love with this awe-inspiring habitat and immediately caught 'jungle fever'. Indonesia is a beauty supreme that never ends - a country comprised of 17,000 islands, where an abundance of geckos roam. I had one in particular in my plush Balinese villa that became so chilled with me, it slid and scurried low along the walls as opposed to their usual plots up high in the ceilings and corners. Ceilings even in the most luxurious of places are often inhabited by them. Geckos mind their own business, so do not bother or scare me, and I appreciated their unique existence. And frogs would routinely cross my path while I walked through the gardens. The different sounds of the animals in this natural environment became the soundtrack of my stay. The mosquitos though were another story! Sigh and more sighs… My chemical-free citronella stretch bracelets from Amazon worked for I would say, a day or two. From then on; I was ravaged daily everywhere I travelled or slept. No f***s were given by these insects of the sun. Especially as my sun-kissed deep brown body was trying to obtain flawless beauty goals while there, and be great. They weren't letting me - so merciless! I accepted the fact to be in this tropical, clean air, real-food-eating paradise; being bitten 24/7 was a small price to pay. Even though I do wish my blood wasn’t so sweet. I think they (dreaded mozzies) instinctively knew my roots and genetics are also from a place close to the equator – so I was familiar, I was like family. 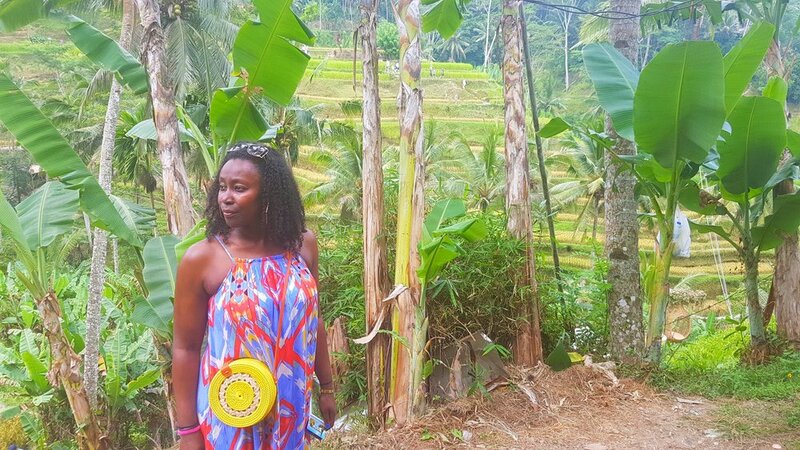 My discomfort had to be eased somehow, and upon talking to locals turned friends I found a special Balinese remedy... *Drumroll and Beychella dance* intro for…. Bokashi oil!!! Yaayyy!!!!! Bokashi oil is a miracle blend of spices and herbal medicinal oils that form a potent pocket-sized natural healer for the body. With a multitude of uses including easing mosquito bites by reducing swelling, itching and healing them with no scarring (Universe; this is my testimony). My post-bite life became manageable and stress-free because of Bokashi oil. Apparently, you can gargle with it for sore throats, use it as a foot soak for smelly feet, and as a topical deodorant too. Bokashi oil came to my rescue. A surprising beauty discovery that I will treasure and incorporate forever. I stocked up for my return home to London. It is now a proud staple in my product arsenal in the "totally natural" section. Yes I caught 'jungle fever' - When I fell in love with a different cultural experience and its remedies of the mind, body and soul. My spiritually happy relationship with Indonesia makes me declare that I’m so proud to have 'jungle fever' of this kind. Next post: You are not alone. © 2018 Karma-Style.com. All rights reserved. Climbed to hazy heights. I was petrified until I surrendered to the vastness.